SAS B (Small Astronomy Satellite B, also known as Explorer 48) was the second in the series of small spacecraft designed to extend the astronomical studies in the X-ray, gamma-ray, ultraviolet, visible, and infrared regions. The primary objective of the SAS-B was to measure the spatial and energy distribution of primary galactic and extragalactic gamma radiation with energies between 20 and 300 MeV. The instrumentation consisted principally of a guard scintillation detector, an upper and a lower spark chamber, and a charged particle telescope. 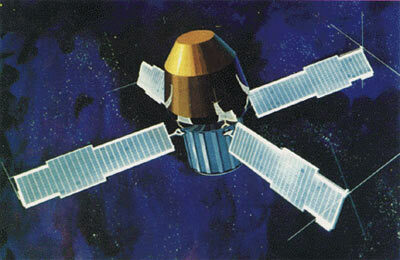 SAS-B was launched from the San Marco platform off the coast of Kenya, Africa, into a nearly equatorial orbit. The orbiting spacecraft was in the shape of a cylinder approximately 59 cm in diameter and 135 cm in length. Four solar paddles were used to recharge the 6 amp-h nickel-cadmium battery and provide power to the spacecraft and telescope experiment. The spacecraft was spin stabilized, and a magnetically torqued commandable control system was used to point the spin axis of the spacecraft to any position in space within approximately 1 degree. The experiment axis lay along this axis allowing the telescope to look at any selected region of the sky with its plus or minus 30 degree acceptance aperture. The nominal spin rate was 1/12 rpm. Data were taken at 1000 bps and could be recorded on an onboard tape recorder and simultaneously transmitted in real time. The recorded data were transmitted once per orbit. This required approximately 5 minutes. The telescope experiment was initially turned on 20 November 1972, and by November 27, 1972, the spacecraft became fully operational. The low-voltage power supply for the experiment failed on 8 June 1973. No useful scientific data were obtained after that date. With the exception of a slightly degraded star sensor, the spacecraft control section performed in an excellent manner.